I'm one of the few musicians and very few cello players who are educated in classical music as well as in teaching jazz & pop music. This can be beneficial for beginners who aren't very familiar with classical music or for advanced cello players who want to try something different. I'm very experienced and educated in musical improvisation and like to incorporate this into my lessons. 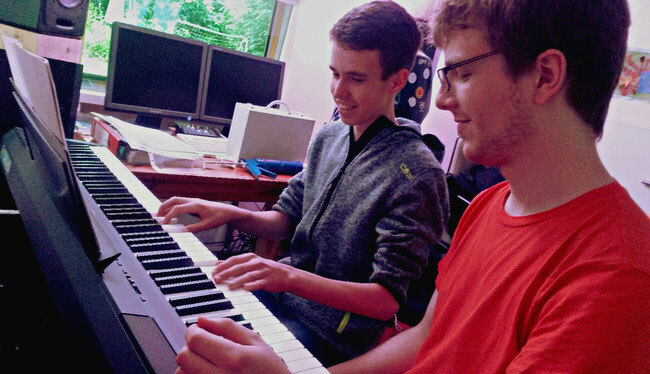 Improvising can support the musical development of a student and can be learned and applied on every playing level and in every musical genre. In my lessons, I'm not only focussing on the technics and the physical part of learning an instrument, but always trying to teach within a musical context. So reading sheet music, listening to music, arranging or composing, music theory, music history and aural training can also be part of my instrumental lessons. I'm very flexible regarding structure and content of my lessons and try to meet the personal needs of every one of my students. If for example a student wants to learn a specific song or playing technique, improve his participation in a band, ensemble or orchestra or work on his own compositions I will always implement this into my lessons. I will teach everybody, regardless of age. I'm also specifically experienced in working with adults (beginning or advanced). Adults are able to learn a new instrument, too! Motivation and fun are always the highest goals of my lessons, before everything else I strive to achieve. Music should be pleasuring after all! Unfortunately I can't offer home lessons anymore. I'm working with a teaching contract, covering my terms of payment, cancelled lessons, period of notice and more. If you are interested, I can send you an example! With a contract of this kind I will teach every week except for school and official holidays in Nordrhein-Westfalen. The first trial lesson costs only 20 Euro! If you are interested in taking lessons, want to learn more about it or arrange a trial lesson, send me message.